The mousse in this recipe is based on a molecular-gastronomy technique described on Food52 of incorporating air into chocolate melted with water to produce a simple, light, and rich chocolate mousse. 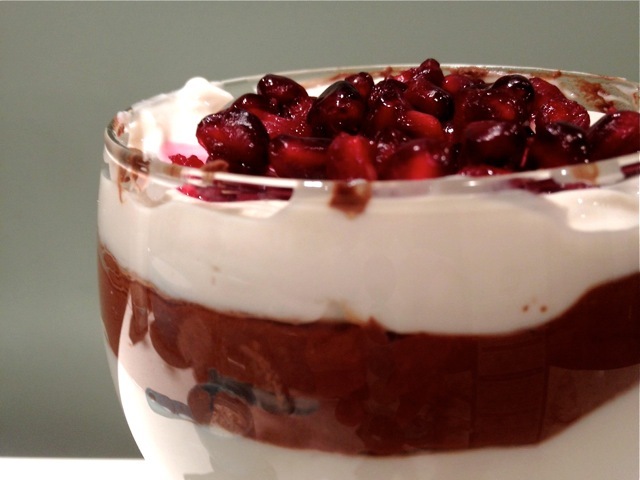 In this dish, I’ve dressed the chocolate mousse up for the holidays by layering it with the contrasting flavors, colors, and textures of lightly sweetened Greek yogurt and pomegranate seeds. Pour the water into a saucepan and warm over medium-low heat. Add the chocolate and whisk until smooth. Set the saucepan in a large bowl partly filled with ice cubes — or, for a faster chill, pour the chocolate mixture into another bowl set over the ice. Whisk the chocolate sauce, either manually with a whisk or with an electric mixer. (If using an electric mixer, watch closely, as it will thicken faster.) Whisking creates large air bubbles in the sauce, which steadily thickens. This will take 5 to 10 minutes, until your chocolate sauce has thickened to the consistency of cake batter. Remove immediately from the ice bath, or else it will solidify. Set aside. Whisk together the yogurt with the confectioner's sugar and vanilla extract. In wine or other clear glasses, layer ⅓ cup of mousse with alternating layers of the sweetened yogurt to make 4 layers total, ending with the yogurt. Top with a few tablespoons of pomegranate arils. Serve immediately, or wrap tightly with plastic wrap and refrigerate to serve later.